""Kentucky III"" is filled with crisp, evocative images: the delicacy of dogwood trees in full bloom, the magnificence of fine thoroughbreds, the view of rolling hills from a gracious antebellum porch. The name "Kentucky" evokes widely diverse images for many people: antebellum mansions graceful as wedding cakes, luminous green hills bubbling up through misty mornings, snow-covered branches of winter-white forests, vibrant cities embracing their history yet moving swiftly into the future. But what is Kentucky, really? In both words and photographs, Kentucky III explores that question. Together again to celebrate the splendor of Kentucky, photographer James Archambeault and author Thomas Clark have created the third in a series of memorable tributes to their beloved state. With fascinating, historical text, and crisp, evocative images that illuminate beauties both grand and subtle of the Bluegrass State, Kentucky III continues to examine the diverse character of the place. Appreciate the delicate array of dogwood trees in full bloom. Catch a glimpse of the magnificent athleticism of fine thoroughbreds. Cool off under the canopy of green of a woodland retreat. Visit the site of Civil War military action. Live through historical interpreters at a restored Shaker Village, and enjoy a leisurely float down the Ohio River to Louisville. The work of photographer James Archambeault graces the walls of many Kentucky homes, and appears in calendars and many national magazines and books. 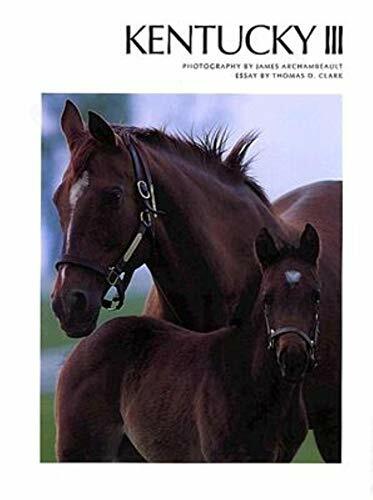 Representing several years and thousands of miles of travel, his first celebration of the Bluegrass State, Kentucky, was followed by the widely popular Kentucky II, both published by Graphic Arts Center Publishing "RM". Thomas D. Clark is a historian of vigor, having taught, lectured, andwritten about the South for the past half century. He has received numerous professional awards both as a professor and as an author. He has written numerous books about Kentucky, including the definitive singlevolume history of the state, History of Kentucky, first published in 1937, Kentucky, and Kentucky II. Together this veteran team has worked their magic once more. Kentucky III portrays in vivid color the beauty that is Kentucky, giving an overview of the history of the Bluegrass States State and showing us where it is today, poised on the brink of the twenty-first century. Front Dustjacket Photo: A thoroughbred mare and her foal pause for their portrait in a spring pasture along Old Frankfort Pike in Fayette County near Lexington. Back Dustjacket Photo: This scene of pastoral elegance and solitude comes close to depicting a "Kentucky state of mind".